In 1915 Robert Baden-Powell, founder of the worldwide Scouts movement, published his DIY guide to espionage, My Adventures as a Spy. Mark Kaufman explores how the book’s ideas to utilise such natural objects as butterflies, moths and leaves, worked to mythologize British resourcefulness and promote a certain ‘weaponization of the pastoral’. 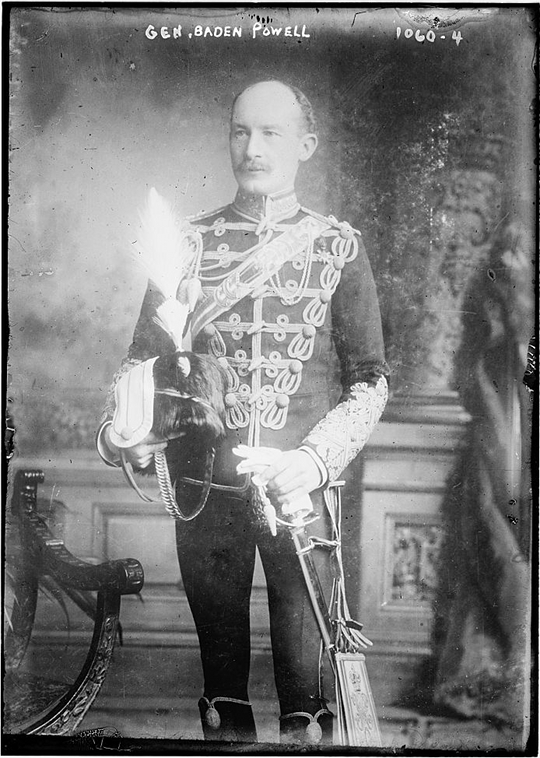 A photograph of Baden-Powell in his miltary get up, probably taken some time shortly after 1900 when he was promoted after his heroics at Mafeking – Source. Upon the outbreak of the Great War in 1914, the fifty-seven-year-old Lieutenant-General Sir Robert Baden-Powell, K.C.B., contacted Lord Kitchener and offered to come out of retirement to serve Britain in its hour of need. The War Secretary, however, believed that the veteran officer had a far more crucial part to play on the home front, training and mobilizing the organization he had founded six years earlier and that now constituted an army in itself: the Scouting Movement. Under the auspices of their beloved Chief Scout, Boy Scouts and Girl Guides were soon working in a variety of capacities and taking up key positions left vacant by soldiers and nurses who had gone to the front lines. In the wake of air-raids, while the Zeppelins still hummed in the distance, Scouts dug survivors out of the London rubble, tended to the wounded, and pedaled through the streets blowing the “All Clear” on their bugles. Compulsorily cheerful, 20,000 Sea Scouts patrolled the east and south shorelines in the absence of the Coastguards, watching for mines and practicing signals to be used at the first sign of the invading Hun—pausing only to observe the mating rituals of seahorses, help an elderly matron hang her washing, or sing a rousing rendition of Play up! Play up! And Play the Game! More furtively, Scouts kept vigil over railways, bridges, and telegraph lines; others kept tabs on local German immigrants, who (their leader was convinced) were inevitably plotting sabotage. All the while, Baden-Powell, with his signature cane and campaign hat, visited parade grounds throughout the Allied bloc, reviewing formations of eager young Wolf Cubs like Wellington on the eve of Waterloo. In addition to marshaling this children’s crusade, Baden-Powell’s other wartime duty was to maintain his self-created legend through publications and appearances. Having commanded and held the British garrison during the seven-month Siege of Mafeking from October 1899 to May 1900, Baden-Powell had returned from the Boer War a national hero, a symbol of ingenuity-in-crisis and a living embodiment of that most mystical of English qualities: pluck. 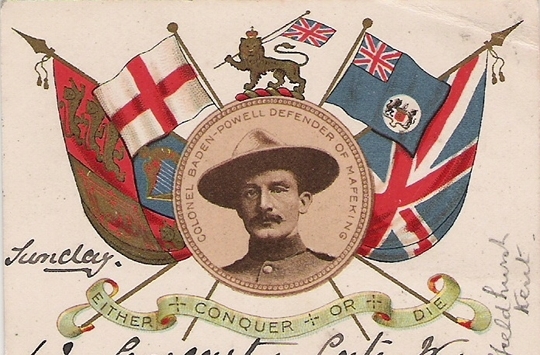 Postcard commemorating Baden-Powell as the hero of Mafeking, ca. 1900 – Source. But even before his apotheosis, the young officer had spent the last quarter of the nineteenth century pursuing a romantic persona, taking part in a bewildering array of military engagements and intelligence operations throughout India, Africa, and the Mediterranean. A prolific writer, talented artist, and sport-enthusiast, Baden-Powell recorded and illustrated his experiences in eminently readable books with eclectic titles like Reconnaissance and Scouting (1884), Pigsticking or Hoghunting (1889), The Downfall of Prempeh (1896), and Sport in War (1900). After his return to England, the officer discovered that lads of all ages were enthusiastically devouring his army scouting manuals, and he surmised that the time was ripe for a youth movement designed to revitalize the ailing empire. In 1908, Baden-Powell published the first edition of Scouting for Boys: A Handbook for Instruction in Good Citizenship, a volume whose overall sales would soon rival both Shakespeare and the King James Bible. As its title suggests, Scouting for Boys was not only a practical guide to tracking deer and dressing wounds, but a compendium of “civilised” ideals drawn from a variety of historical and literary sources. Reinscribing his own initials as a code of conduct, the hero of Mafeking enjoined his Scouts to “Be Prepared” for any contingency and to uphold the law of chivalry passed down (quite literally) from the Knights of the Roundtable. In an era of modernization and increasing political turmoil, this message had tremendous appeal; by 1910, the movement boasted 100,000 adherents in Britain, as well as offshoots in North America, Europe, and elsewhere. Baden-Powell was an international celebrity. 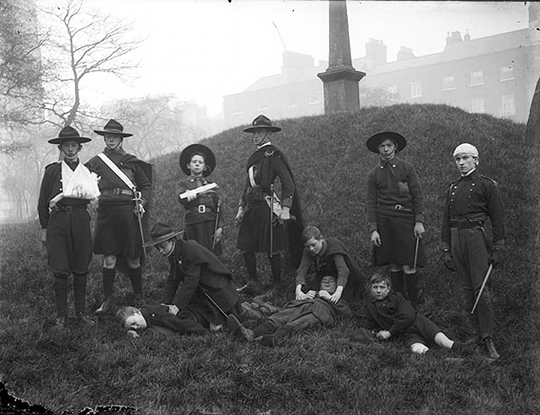 Group shot of Fianna Éireann scouts engaged in field medical training, Northern Ireland, ca. 1914 – Source. The ideological and propagandic valence of Baden-Powell’s project reached its zenith during the Great War, and his writings at the time worked to mythologize British resourcefulness. In 1915, he published My Adventures as a Spy, an account of his varied experiences in the field of military intelligence, primarily in the Mediterranean region between 1890 and 1895 (he gives few dates and is often vague about locations). Half memoir, half manual, this slim, loosely-organized volume reinforces the crucial correspondence between “scouting” and “spying” that Baden-Powell established in his earlier handbook, thereby underscoring for a wartime audience that scouting was not only defensive but potentially offensive, a means of gathering intelligence and sabotaging the enemy’s operations. Essentially writing as an apologist for the spy, whom he believed was unjustly maligned in the popular culture of the time, the Chief Scout interlaces personal anecdotes with advice and illustrations concerning proper methods of disguise, surveillance, and encryption. Highlighting the training-potential of play-acting and games like “Hide-and-Seek,” the author yarns about how he successfully put these skills to the test, duping foreign officials from North Africa to the Balkan Peninsula. Carrying this book and a colour-box and a butterfly net in my hand, I was above all suspicion to anyone who met me on the lonely mountain side, even in the neighbourhood of the forts. 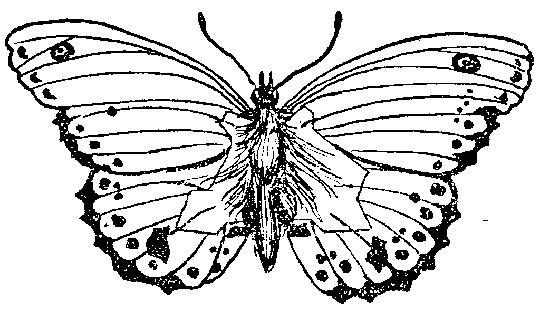 “This sketch of a butterfly contains the outline of a fortress, and marks both the position and power of the guns. The marks on the wings between the lines mean nothing, but those on the lines show the nature and size of the guns, according to the keys below”, from Baden-Powell’s My Adventures as a Spy (1915) – Source. Butterflies were only one of Baden-Powell’s wingèd agents; even the most mundane of moths could veil the blueprint of an enemy compound. 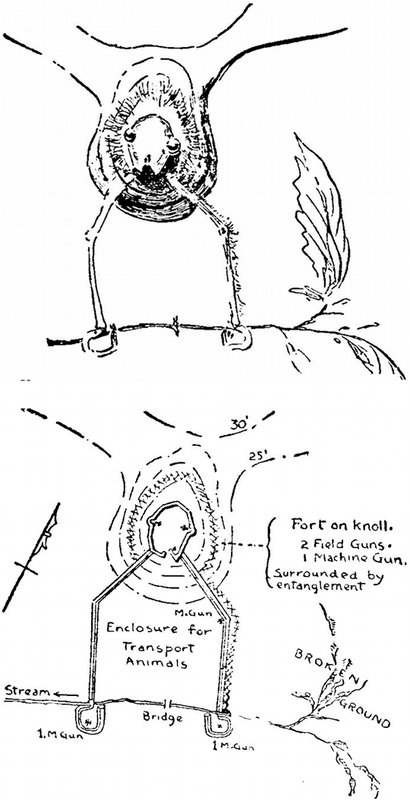 Concealing a fort in a moth’s head, from Baden-Powell’s My Adventures as a Spy (1915) – Source. In addition to the insects themselves, the author advocates using sketches of leaves to mask the profiles of hilltop fortresses. “A smart piece of spy-work. 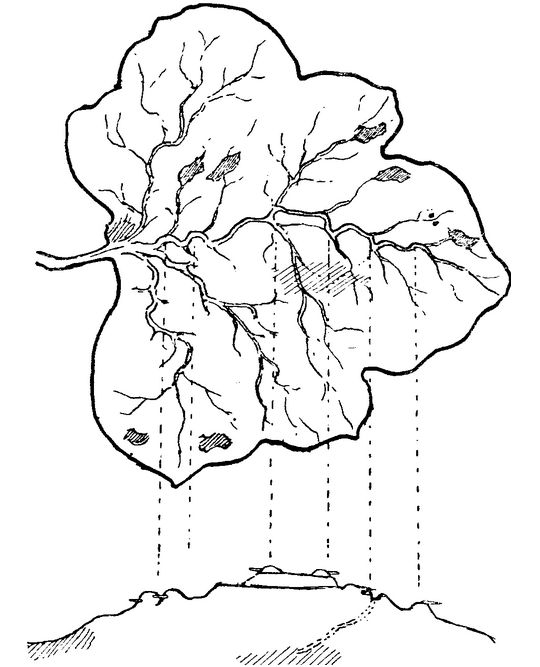 Veins on an ivy leaf show the outline of the fort as seen looking west (Point of the leaf indicates north. )”, from Baden-Powell’s My Adventures as a Spy (1915) – Source. Reading My Adventures as a Spy, one wonders how hard Baden-Powell really needed to work at playing the dotty Englishman on these Balkan excursions. His outlandish feats of intelligence gathering — if they happened at all — most likely succeeded through a felicitous combination of blind luck and the incompetence of local officials. Indeed, Baden-Powell’s commentators have consistently questioned the authenticity of his entomological intrigues, usually ascribing them to the great man’s need to cultivate his own greatness, particularly at a time of national crisis. As his biographer, Tim Jeal, has pointed out, Baden-Powell’s prolific diaries from his military years bear very little evidence in support of his claims, and what evidence there is may have been added at a later date — the Chief Scout was known to “amend” his diaries in anticipation of biographical enquiries. If spying, as Baden-Powell admits, “teaches one to trust no one,” that same aura of suspicion inevitably redounds to the hero himself. However, we need not concern ourselves with the truth of these spy yarns to see their cultural significance in an era of social and political change. Within that heady alchemy of imperialism, individualism, social Darwinism, and romantic fantasy that also characterizes Scouting for Boys, we find what is arguably the constitutive thesis of the early Scouting Movement and one of Baden-Powell’s chief preoccupations: the paradoxical notion that democratic equality must be achieved through the dissemination and cultivation of upper-class values. It is no mistake that the writer refers to spies as a “much abused gentry”; for Baden-Powell, the honorable secret agent correlates with the gentleman of leisure, who — like John Buchan’s contemporaneous “clubland” heroes — utilizes his superior breeding and public-school education in the service of King and Country. At one point, Baden-Powell observes that the German espionage network, though extensive, is lacking in “men of a higher education and social position,” and so doomed to misadventure and treachery. While he grants that there are such things as “traitor spies,” the officer assures his readers that “we are not much troubled with them in England.” “Fortunately,” he explains, “the Briton is not as a rule of a corruptible character.” Such a statement may strike us as laughably naïve in our more cynical, post-Cambridge-Spy-Ring era— Malcolm Muggeridge once referred to Kim Philby as a “boy-scout who lost his way” — but this unwavering faith in the integrity of the elite persisted throughout the first decades of the twentieth century and clearly informs the writer’s valorization of the spy. From this class-oriented perspective, Baden-Powell’s privileging of genteel pursuits as covers for espionage— butterfly-collecting, landscape-painting, play-acting, fly-fishing, partridge-shooting, and so on — comes to serve a function that is not only political, but strangely elegiac. Invariably referring to spying as a “sport,” “art,” or “game,” the Chief Scout reveals that these aristocratic activities “spent largely in enjoyment” are, in fact, the keys to a desperate strategy: the weaponization of the pastoral. In contrast to the horrors of modern warfare, the barbed wire and poison gas that so appalled him on his visits to the front, Baden-Powell offers what seems to us now an idyllic Nabokovian childhood as a training regime for a more “civilised” conflict that never truly existed, save in his own recollections and in the daydreams of his faithful Scouts. In a sense, My Adventures as a Spy is a last-ditch effort to resuscitate — or perhaps to preserve, like a butterfly pinned under glass — a mortally wounded world.